Pranksters know that even dull office PCs can be playgrounds and that little surprises can have a big impact. The real secret of successful pranking is simplicity. Your prank should be quick to implement and even quicker to reverse, especially if you're working for a company that doesn't look kindly on time wasting. All you need is a Windows PC and a suitable victim. Don't worry, we're not going to do anything dangerous here – although we still wouldn't recommend trying any of these pranks on someone who won't see the funny side of things. You don't need a sense of humour to punch someone in the face. This is easiest to do in an office where there are lots of PCs gathered near one another. Just unplug your victim's keyboard or mouse and plug in another one that you control. When they type or move the mouse, so do you – but of course it's your input that controls what happens on screen. Wireless mice are handy things, but they're full of prank potential. Wait until nobody's looking and install a wireless mouse adaptor on your target's computer, but leave their existing mouse connected. Windows will accept input from both devices, so wait until your victim's doing something fiddly and then send their mouse pointer on an adventure. If you only do it occasionally, this prank can go undetected for days. Remote access software enables you to control one PC from another, Apps such as TightVNC can be installed without leaving any obvious sign that they're running (unless your victim's using Windows Vista: its beefed-up security makes such mischief considerably harder to get away with). With VNC installed on your machine and your target's, you can take control of their PC from anywhere with an internet connection. Make sure your firm's IT policies don't prohibit installing unauthorised software or fiddling with firewalls, though: any remote control software is a potential security risk and some companies won't see the funny side. You should also remove the software as soon as you've pulled your prank. 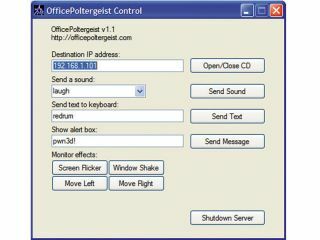 Or there's Office Poltergeist, which is like VNC, but designed specifically for messing with your co-workers. Once you've installed the server on your victim's PC and the controller on yours, you can open and close their CD drive, play silly sounds or pop up alert boxes on their screens. Don't visit the Google group that's linked to from the Office Poltergeist website, though: it's been defunct for ages and has been overrun by spammers of the 'not safe for work' variety. AutoCorrect In Word (and many other text based programs) is a godsend - and it isn't long before people start to rely on it. That means that a few well chosen edits of the AutoCorrect and AutoText options in Word can cause chaos, either by turning correctly spelt words into typos or by triggering unwanted and/or inappropriate text whenever the user tries to type something. Be gentle, though: not everybody proofreads documents before circulating them and you don't want to get anyone fired. In days of old, we'd take the ball out of people's mice, but today's mice tend to be optical rather than mechanical. Not to worry – a bit of tape will screw up a modern rodent's sensor just as efficiently. The Mouse Properties dialog is surprisingly handy for pranksters. Changing the mouse speed to its slowest setting turns even the simplest movement into an ordeal, while swapping the left and right buttons or reprogramming extra buttons can make the most Ghandi-esque gentle soul want to scream like a wounded gorilla. Popping the caps off a few keys and swapping them around is an easy way to mess with people. Good choices include swapping 7,8 and 9 with 1, 2 and 3 on the number pad or swapping B, N and M for F, G and H on the main keyboard. This prank won't work on touch typists, of course – but don't worry, you can catch them out with a quick fiddle of Windows' region and language settings. A few moments of tweaking enables you to entirely remap the keyboard – to a left-handed Dvorak keyboard layout, for example. The beauty of this prank is that plugging in another keyboard won't solve the problem, so it takes a computer savvy user to fix. ClearType font smoothing is designed to make on-screen text as readable as possible, and Microsoft kindly provides a tuning tool so that you can make it perfect. In the wrong hands (ours), however, it can also make text exceptionally hard to read. On a Windows XP or Vista machine, download the tuner from here, run it and select the fuzziest option every time. If your victim doesn't complain and make you fix it, though, it's still a good idea to change things back at the first opportunity – if you don't, they'll end up with a splitting headache. Depending on the video card installed in the system you're fiddling with, you may be able to rotate the screen by 90, 180 or 270° by either pressing [CTRL]+[ALT] and the arrow keys or by right-clicking on the video card's icon in the System Tray. For example, on our machine – which is running a Radeon card – we need to right-click on the ATI icon, select the display and then click on Rotate Display. If the key combination doesn't work and you rotate the display from the tray icon, you get bonus points, because changing it back is fiddly and annoying. If your victim turns their monitor upside down to solve the problem, give yourself extra points as well. This trick is as old as computers themselves, but people still fall for it hook, line and sinker. All you need to do is take a screenshot of your victim's desktop, hide all of their icons and then replace their wallpaper with the screenshot. Sit back and smirk as they click repeatedly – but all to no avail. As the Buzzcocks once succinctly observed: noise annoys – and it's even more irritating when you can't stop it. To pull off this brand of hi-jink, simply take your target's speaker cable and plug it into your PC instead of theirs. Now anything you play on your PC will come through their speakers, whether it's novelty pop songs, death metal or an array of silly sound effects. There are two ways to mess with system sounds: straightforward and subtle. Best for those who haven't much time to fiddle, the straightforward way is to download an assortment of '.wav' files and replace your victim's common system sounds through the Control Panel. The subtle way is to use a sound editor such as Audacity to insert lots of silence at the beginning of your downloaded sound files. That means there's a big gap between the event that causes the sound– logging onto Windows, a User Account Control window appearing or anything else you fancy – and your chosen sound effect. We've found that terrifying screams are particularly effective.